Ahead of a custody trial, Judge Raymond G. Wheless issued a temporary decision Wednesday on the immediate future of the children of Deion and Pilar Sanders. The couple, who have three children together, have been in a bitter divorce battle in Collin County since last year. On Wednesday, NBC 5 obtained a copy of Wheless' decision dated Jan. 16, 2013, that split custody of the children 50-50, but allows Deion to make all decisions regarding the children's education, residence and athletic endeavors. All other decisions regarding the children are to be made jointly. 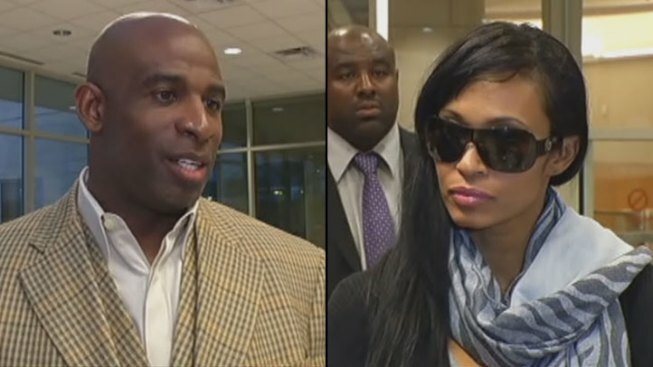 "The judge has decided that Deion Sanders should have the exclusive right to establish his children's primary residence, the exclusive right to make educational decisions on their behalf and the exclusive right to make decisions on athletic programs they participate in," said Rick Robertson, attorney for Deion. "This is a very, very significant victory in determining who the primary conservator of the children is." Pilar previously had control over educational decisions, but Wheless most recent decision reversed that. Instead of Deion having custody of the boys and Pilar their daughter, as it has been, both parents will now have joint custody and will have all of their children on alternating weeks for a week at a time. "This decision is all about our children. I won't get into any mudslinging or a response to my intelligence and fatherhood. I don't do that. I just desire the best for all my kids and I'm pleased the judge has expanded my rights as a parent," said Deion. Larry Friedman, attorney for Pilar, issued a statement to NBC 5 Wednesday where he said the judge's decision is a step in the right direction for Pilar. "This is a step in the right direction for my client. It puts Pilar back in the driver's seat and allows her to spend time with all three of her children. Deion screwed up everything in his life but his football career," said Friedman, in a statement to NBC 5. Deion is additionally ordered to pay $5,500 per month in child support and an amount of $108,000 due to Amicus Attorney Jeffrey Shore. The jury trial to determine custody is set to begin March 8. The divorce proceedings are being handled in arbitration. NBC 5's Ellen Goldberg and Randy McIlwain contributed to this report.